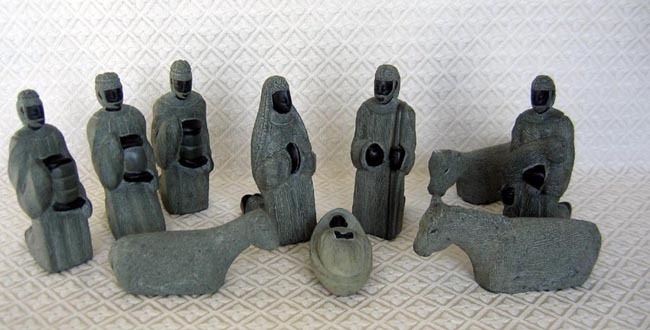 This Nativity set from Haiti is hand-carved from locally available river stone. The natural color of the stone is gray. The artisans rub a black paste, made from a water-soluble aniline dye, into the hands and faces of the figures to dye them. Next, they apply a coat of black shoe polish and then a coating of beeswax to add luster. The ten pieces include: Joseph, Mary, baby Jesus, a shepherd holding a sheep, three animals, and three wise men. The kneeling Joseph measures 5.5 inches tall. This Nativity was carved by Dona Louissaint. He was carving river stone on the front stoop of his new home when the Haiti earthquake struck on January 12, 2010. His house collapsed to the ground. Thankfully, Dona, his wife Nerline, and their 4-year-old son Leonardo were not injured. Dona retrieved the corrugated metal roof from the ruins of his house and built a temporary shelter for his family. The family used the income from carving river stone Nativities to start rebuilding their home. The Nativity set is marketed by Comite Artisanal Haitien (CAH), an organization that has been committed for over 30 years to working with Haitian artisans to find markets for their products to help them earn a dignified living. CAH represents more than 170 individual Haitian artisans and groups. In Haiti, the poorest countries in the western hemisphere, jobs are scarce and the money earned from craftmaking is not just supplemental, it is often the sole source of income for most artisans and their families. Eighty percent of the people in Haiti live on less than $2 a day.